After months of wanting one, I bought myself an Instant Pot on Amazon Prime Day! I've never, ever used a pressure cooker before so I was really eager to give it a try. For my first test run, I decided to work with this recipe from Serious Eats for Miso Risotto in a pressure cooker. I adapted it a bit with the ingredients I had on hand. And, although the recipe is written for an electric or standard pressure cooker, I didn't find the instructions intuitive for my first time using the Instant Pot. But the results were fantastic. I would never make risotto the traditional way in the middle of summer. It just makes the kitchen too darn hot. But this method makes it very quick and easy, and doesn't heat up the kitchen! The first thing I learned about the Instant Pot is that the actual cooking time can increase and even double when you add time to preheat and release the steam. 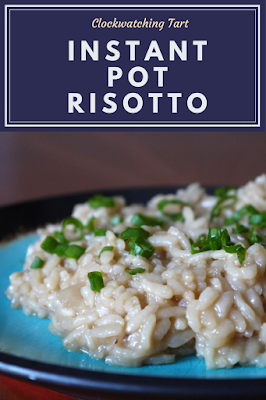 In this case, the risotto was still very quick and worth the effort. The second thing I learned, which was a big surprise, was that the saute feature gets very hot! Never having used an electric pressure cooker, I was very surprised how hot it got. You'd need to keep a close eye on it not to burn your garlic. Have all ingredients measured, prepped and ready to go before turning on the Instant Pot. Press the "Saute" button and wait until preheated (less than a minute). Add the oil, then the onion and saute about 2 minutes until softened. Add the garlic and saute one minute more. The pot insert will move around, but you can hold on to the edge with a kitchen towel to keep it steady. Add the rice and cook, stirring for about 4 minutes until the rice is toasted and coated in oil. Add the sake or sherry and cook, stirring until mostly dry. Stir in soy sauce and miso paste. Add stock. Make sure all ingredients are submerged and there are no grains of rice or pieces of onion stuck to the sides of the pot, and make sure the rim of the pot is clean. Put the lid on the Instant Pot and click it closed. A little tune will play to indicate it is properly closed. Push the "Manual" button. Push the "Pressure" button until the Low Pressure light is on. The timer will default to 30 minutes. Press the minus - button until the timer says 5 minutes. After 10 seconds, the program will start. It took about 5 minutes to come up to pressure, then the timer started counting down. Once 5 minutes was up, the pot went into "Keep Warm" mode. To quick-release the steam, press "Cancel" and turn the steam nozzle to "Vent". Depressurizing took about 2 minutes for this recipe. Once the pressure is released, open the lid, being careful to turn your face away from the steam. Stir the risotto a few times until it thickens. Add salt to taste if desired. Mine didn't need it. Serve the risotto in shallow bowls, topped with chopped chives or green onions.